Field update! Southern Resident Killer Whale Health Assessments — SR3 Sealife Response, Rehabilitation, and Research improving the health of marine wildlife. SR3’s Dr. Holly Fearnbach and NOAA colleague Dr. John Durban are still in the field around the San Juan Islands, conducting a key health assessment of the endangered population of Southern Resident killer whales. The team has been using an unmanned octocopter drone to non-invasively collect high-resolution aerial images that will be analyzed to quantify growth and body condition, to support recovery actions aimed at maintaining an adequate food supply. These aerial images can also be used to provide real-time updates on health and foraging success. Unfortunately, there continue to be a number of whales in the population that are in poor and declining body condition and we remain concerned about the condition of J pod in particular (see photos). The good news is that we have documented successful foraging from the air (see photo) and hope that if they are given space and can find sufficient food, the whales may be able to improve their condition. In the coming months, the images will be analyzed to add to a 10-year time series of whale growth and condition. Aerial images of three adult females from J pod from September 2018 (J41, left, J16, center and J17, right). J41 is in robust condition and her width at mid-body indicates that she is pregnant, while J16 and J17 are in notably lean condition. Image by SR3 and NOAA Southwest Fisheries Science Center, obtained using an unmanned octocopter that was flown >100ft above the whales under NMFS permit #19091. Aerial image of J41, a pregnant Southern Resident killer whale, successfully foraging alongside her juvenile offspring J51 in September 2018. 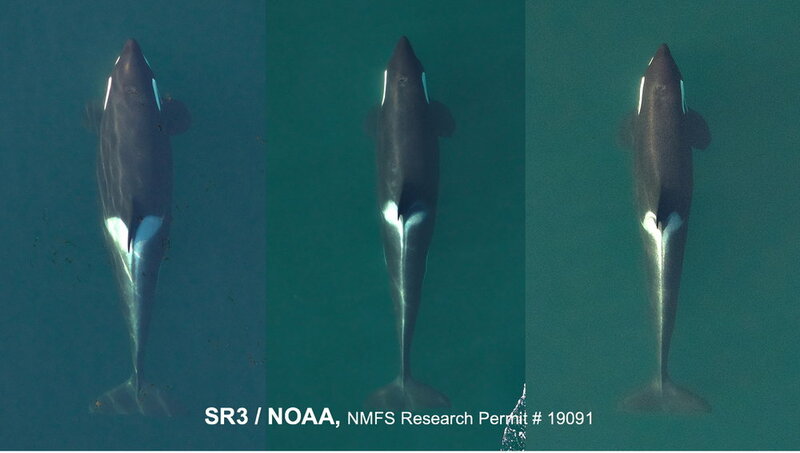 Image by SR3 and NOAA Southwest Fisheries Science Center, obtained using an unmanned octocopter that was flown >100ft above the whales under NMFS permit #19091.